It's been interesting following how Swedish news portrays the USA election compared to here in the USA. Even though here in the USA there has been a lot of stuff being thrown around in regards weird allegations and other miss information. In Sweden it seems like that is the only stuff being reported. It's also very annoying to see everything being so ridiculously tilted towards one candidate. When I read news I tend to prefer it when it is as unbiased as possible. It's very hard to find any article at all in Swedish newspapers that says anything positive about McCain the last couple of months. For instance I read this article, now the article isn't that bad (It is about the Irish Bookie calling the election early). But the picture that went with the picture was the one to the right here. 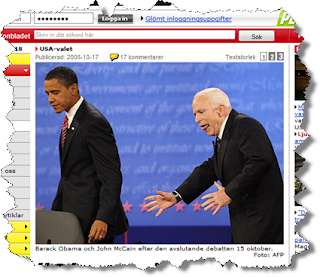 For some reason Aftonbladet in their infinite wisdom saw that this pictures which makes McCain look like some kind of grabbing lizard was the right picture to accompany an article that was about an Irish bookie. It would make a better sense with a picture of the bookie (Which is what the US news agencies I've seen ran with). Also reading the readers comments on these articles are scary. It seems like people think Obama is some sort of second coming. However, I seriously doubt that almost anybody in Sweden can recite accurately any specific policy that either candidate is promoting. One of the comments I read was that the economy in Sweden would probably be better if Obama won. I would highly doubt that myself since Obama is the one of the two candidates which is against free trade. In full disclosure I am leaning towards Obama myself (Although since I'm not allowed to vote who cares) but it is not with any vehement conviction. The main thing that tilted me over to his side actually is the running mate of McCain who frankly scares me. It's not because I'm sexist (I had very little against Clinton except she seemed a little too calculating). It's just that Palin seems like an idiot talking head and I don't want people like that to lead regardless of their gender.